Del was born on a ship somewhere between Tasmania and Townsville and together with two older brothers, was reared by a Townsville couple after her parents died. When young Del attended the Church of England church services three times a day and attended Railway Estate State School to scholarship level. Her community activities began at 14 when she joined the YWCA for both social and community work purposes. During the war years Del was a secretary of the American Red Cross and her house in Hyde Park billeted many soldiers while Del was also busy with the auxillary fire service. After the war Del was involved with in inter-house sports organised by the YWCA. Teams from religious, business, sports, or community clubs from all over North Queensland would compete. The competitions ran for about 10 years. Del was also instrumental in setting up marching girl teams in Townsville in the 1960s. She knew nothing about marching at first but soon learnt and was chief judge after three years. Del is best known in Townsville for her work with the Choral Society which she began shortly after the war. She was secretary for 20 years from 1958 and produced 21 musicals. Del was a life member of the Society. She was also involved with Eisteddfods starting with the juvenile eisteddfod in the 1950s and was president for 5 years. 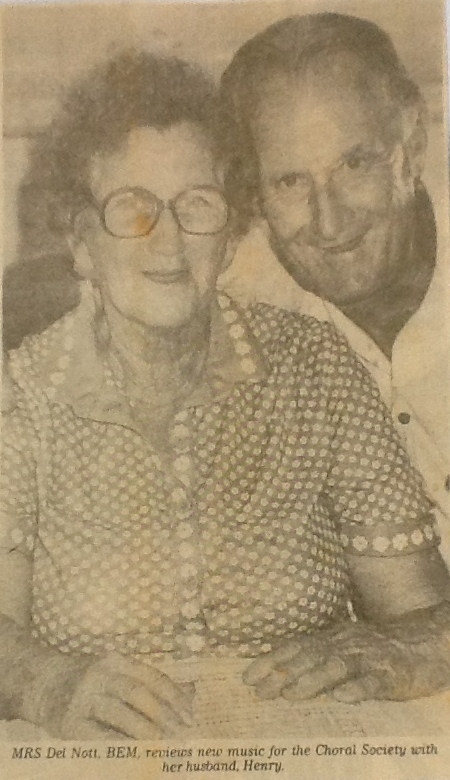 She was secretary of the North Queensland Eisteddfod Townsville local committee from 1950 to 1975. Del was a life governor of the North Queensland Eisteddfod Council and life member of the Townsville Juvenile Eisteddfod. Apart from her community work, her personal interests included painting, leatherwork, and golf. She was awarded the British Empire Medal (B.E.M.) in 1983.